Yesterday, the Office for National Statistics (ONS) published new research on the impact of automation on the English labour market. It found that 1.5 million jobs are at high-risk of automation and you can ask whether your occupation is one of those most at risk by chatting with their bot. While these new stats point to a risk lower than the one we have previously identified, their trends are very much in line with our findings and broader literature on the topic. So what policy responses would best help people and places embrace this challenge? As the ONS highlighted, some places will be more adversely affected by automation than others. In our research last year, we found that it is cities in the North and Midlands, places like Mansfield, Sunderland and Wakefield, that are more vulnerable to job disruption by 2030, while cities in the South East, like London and Reading, will be more resilient. Generally speaking, the places that are more vulnerable to automation are also our weaker economies. As such, if we want every place to make a success of automation, we need to particularly focus on supporting these weaker places to become stronger economies. To do so, we need to make them more attractive to high-skilled business investment, by focusing on creating a talent pipeline, offering adequate office space in city centres, and improving transport links within cities. As the labour market evolves, so are the skills required on the job. Analytical and interpersonal skills, such as problem-solving, creating thinking and customer awareness have never been so important and it is essential young people entering the labour market are equipped with them. To achieve that, we need an excellent education system complemented by opportunities to learn by doing. In recent years, the Government has already done a lot of work to improve the provision of compulsory education. But interpersonal and analytical skills are not only learnt in the classroom and children must have the opportunity to apply these skills in practice. An example of this is the new ‘My activity passport’ initiative launched earlier this year by the Education Secretary Damian Hinds, which provides advice for parents on the types of extra-curricular and everyday activities children at each educational stage could undertake to develop these skills. This is a good first step in the right direction but what is needed is a common framework, developed by Government, to define these skills and how best to embed them in education. While it is important that young people are prepared for the labour market of the future, we must not forget that two-thirds of the workforce of 2030 have already left compulsory education. As such, any approach aimed at preparing people for the age of automation needs to support those already in the labour market to adapt to these changes. This means completely changing the country’s approach to lifelong learning and adult education. Back in the 2017 Budget, the Government unveiled its plans for a National Retraining Scheme, but the scope of it is still too limited. A job-for-life is becoming a thing of the past so, while particular attention should be given to people in occupations more vulnerable to automation, everyone should have access to lifelong learning. Learning from other countries that have adopted this approach for quite some time – like Denmark or Singapore – would prove invaluable, and so would growing a body of evidence to understand what works in terms of adult education. 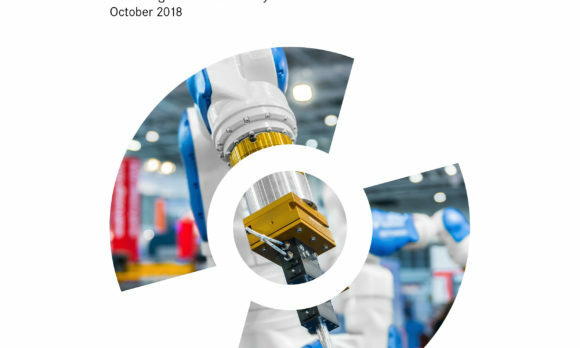 Yesterday’s research by the ONS is a good reminder of the pressing challenges automation and structural changes more generally are posing to the labour market. However, with concerted effort both at the national and local level, the UK can make a success of this so-called ‘fourth industrial revolution’ as it did with the three before that.